Up for sale is an issue of Scott News dated 1939 that features the Scott Phantom Deluxe Radio Receiver. Most of the info discusses the Phantom but one page is devoted to the Scott Philharmonic. Fair condition, shows wear, a couple small tears along the bottom edge, and has been tri-folded. The book is a hard bound book with about (19) individual NRI course booklets within as well as about (10) issues of NRI News magazine. All are dated 1929. Also included are about (10) issues of NRI News magazine and few more inserts. Very Good (VG) – Top grade - a nice copy, with all pages present, nice clean covers and no tears or stains noticeable. Looks practically new! Good/Very Good (G/VG) – A complete and clean magazine, possibly with minor light cover wear. 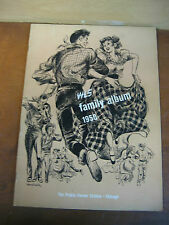 1950 WLS RADIO FAMILY ALBUM. The Radio Collector’s Directory and Price Guide 1921 - 1965. Antique Radio Restoration Guide. Collector’s Guide to Antique Radios. A wealth of information! Clean, unmarked pages, yellowed from age. One piece of scotch tape on the cover. WINDSOR EDITION. Very Good (VG) – Top grade - a nice copy, with all pages present, nice clean covers and no tears or stains noticeable. Looks practically new! Possible small cover edge tears or light stains. 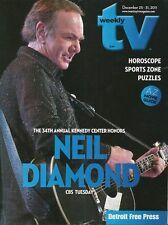 TV WEEKLY 2011 DEC. DEC. 25-31 NEIL DIAMOND (FAIR/GOOD CONDITION). Very Good (VG) – Top grade - a nice copy, with all pages present, nice clean covers and no tears or stains noticeable. Looks practically new! By Baumbach. Look for the Dog :Illustrated Guide to Victor Talking Machines. This bag has advertising for Kacti needles Recoton needles Victor Columbia Bluebird Decca Okeh Records and Albums. It has great advertising lettering and graphics on it. TV GUIDE MAGAZINE 1975 FEB. 8-14 BOB NEWHART (FAIR/GOOD CONDITION) DETROIT ED. DETROIT EDITION. Possible small cover edge tears or light stains. Any major defects noted. “Rolled Spine” – Spine edge is curled from being folded back when read. Very Good (VG) – Top grade - a nice copy, with all pages present, nice clean covers and no tears or stains noticeable. Cornell TUBE RADIO Advertising Brochure Vintage. TV GUIDE MAGAZINE 1966 OCT. 1-7 VIETNAM WAR (FAIR/GOOD CONDITION) DETROIT ED. DETROIT EDITION. Good/Very Good (G/VG) – A complete and clean magazine, possibly with minor light cover wear. Any major defects noted. Possible small cover edge tears or light stains. “Rolled Spine” – Spine edge is curled from being folded back when read. Contains 8 pages in all. Very Good (VG) – Top grade - a nice copy, with all pages present, nice clean covers and no tears or stains noticeable. Looks practically new! Possible small cover edge tears or light stains. Any major defects noted. Good/Very Good (G/VG) – A complete and clean magazine, possibly with minor light cover wear. Any major defects noted. Very Good (VG) – Top grade - a nice copy, with all pages present, nice clean covers and no tears or stains noticeable. 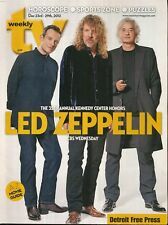 TV GUIDE MAGAZINE 2001 AUG. 4-10 THAT'S 70'S SHOW (FAIR/GOOD COND) DETROIT ED. DETROIT EDITION. Possible small cover edge tears or light stains. Any major defects noted. “Rolled Spine” – Spine edge is curled from being folded back when read. Good/Very Good (G/VG) – A complete and clean magazine, possibly with minor light cover wear. In very good condition with fold, stain and rip on the bottom left of the cover, see photos. Wonderful book for that special collection or decoration. TV GUIDE MAGAZINE 2000 JUN. 10-16 WHERE ARE THEY NOW(FAIR CONDITION) DETROIT ED. Very Good (VG) – Top grade - a nice copy, with all pages present, nice clean covers and no tears or stains noticeable. Looks practically new! SPINE OF THE BOOK HAS SMALL TEAR NEAR STAPLES. Good/Very Good (G/VG) – A complete and clean magazine, possibly with minor light cover wear. Good/Very Good (G/VG) – A complete and clean magazine, possibly with minor light cover wear. Any major defects noted. Possible small cover edge tears or light stains. “Rolled Spine” – Spine edge is curled from being folded back when read. TV GUIDE MAGAZINE 1969 OCT. 11-17 WORLD SERIES (FAIR/GOOD CONDITION) DETROIT ED. 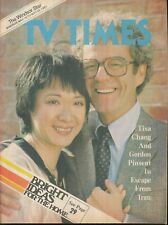 TV GUIDE MAGAZINE 1980 FEB. 23-29 80'S EDITION (FAIR/GOOD CONDITION) DETROIT ED.